Peter Murchie has signed a new one-year contract with Glasgow Warriors, keeping him at Scotstoun until May 2017. 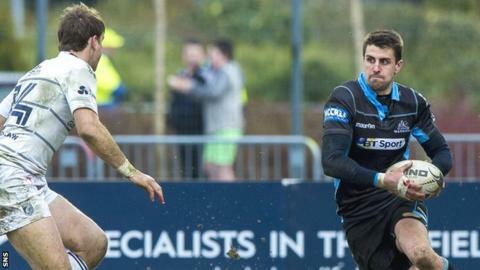 The Scotland full-back, 30, joined the Warriors in 2009 from London Welsh and has since played more than 100 games. "I've witnessed huge growth at the club and we're now selling out Scotstoun for the majority of our home games and it's a great place to play rugby," he said. Meanwhile, 24-year-old full-back Glenn Bryce, who has made 13 appearances, will join Edinburgh in the summer. He joins team-mate Duncan Weir in switching to the Warriors' Scottish rivals. Bryce told the Warriors website: "It was a really hard decision to leave Glasgow but I'm hoping to kick on at Edinburgh and play as regularly as possible next season. "Getting involved during the Rugby World Cup period for Glasgow was a high for me. I've loved my time at the club." Murchie captained Warriors to a 12-6 win over Leinster on Friday as the defending champions continued their push for a Pro12 play-off place. He joins Jonny Gray, Finn Russell, Pat MacArthur, Fraser Brown, Alex Allan, Sila Puafisi, Ali Price, Ryan Wilson, Rob Harley and Chris Fusaro in committing his future to Gregor Townsend's team. "Peter has made a huge contribution to the club over the last seven years, so it's great news that he's staying with us," said the head coach. "He sets the standard for the squad in how to conduct yourself as a professional and works very hard to improve as a rugby player."